Interviews are often considered the most important part of the job application process. During these interviews, you have the opportunity to showcase your technical skills, wow them with your personality, and learn more about the company from your potential future coworkers. As you talk to hiring managers, recruiters, and team members, you get a chance to highlight why you would make a good addition to the company. Once the interview is over, you can breathe a sigh of relief. But, you’re not off the clock just yet. You should send a follow up email to each person who interviewed you, in each round. This includes the recruiter on your phone screen and everyone you meet with in person. If you do not get their contact info during the actual conversation, ask the recruiter or whoever your contact was at the company, for their email addresses so you can send thank you notes. Thank you so much for organizing the interviews today. It was great to chat with [names of interviewers] and learn more about what they are each doing on [teams]. I am really excited about all of the important work being done at [company] in the [space] and how my skills can help the teams. 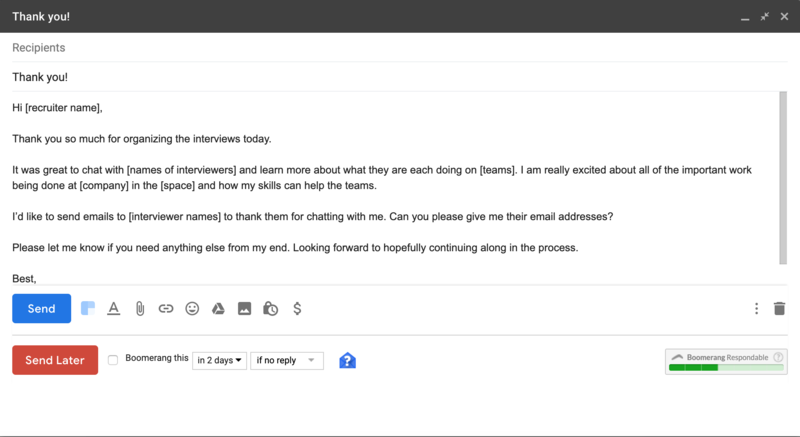 I’d like to send emails to [interviewer names] to thank them for chatting with me. Can you please give me their email addresses? Please let me know if you need anything else from my end. Looking forward to hopefully continuing along in the process. You should send these emails directly after your interviews, so the conversations are still fresh in their minds. In these follow up emails to the interviewers, you should be polite and grateful for the information you learned. Bring up something specific that you talked about with the interviewer and remind them about how excited you are to work there as well as the impact you can make. Thank you for taking the time to chat with me today! It was great to learn more about the exciting work you are doing at [company] to [solve problem – ex: use machine learning to revolutionize the grocery store shopping experience]. I especially enjoyed our conversation on [specific topic and how it relates to you/your experience]. I’m looking forward to continuing on in the process with [company] and hope to meet more people on your team. It is likely that you will not receive a response from the team members and even hiring managers that interviewed you. Not a problem. This email is to make sure that you give them a final good impression of you. They also act as a final showcase of your soft skills, which are harder to come across in interviews. Strong communication, respect, and kindness are traits people are looking for in their future teammates and employees, so showcase that in your emails. If you feel like you might not have done as well as you could have in your technical interview, you can use the email follow up to highlight what you would have done differently. You can say something like, “I was thinking more about the question you asked and I actually think [this] might have created a more optimal solution.” Recruiters do not see this a lot and are often impressed when they get follow ups like this. After you have sent a follow up email to the recruiter, you should wait a week for a reply. If you do not receive one, you should follow up once more with a different email in the same thread. This is a polite reminder, as you know they are busy, but you want to check in on the status of your application. You can also use this email to mention other jobs you are in the process of interviewing with (in general terms) to let them know that there is a time constraint on your end. Using these templates and being polite to the recruiters and interviewers will help maintain their positive impression of you. Adding specific elements from your conversations or technical questions will show that you are thoughtful and interested in the company and the work they do there. With these tips & templates at your disposal, you should be more than ready to send great follow up emails to recruiters and hiring managers. Pathrise is a career accelerator that works with students and young professionals 1-on-1 so they can land their dream job in tech. If you want to work with any of our advisors 1-on-1 to get help with your cold emails or with any other aspect of the job search, become a Pathrise fellow.